Native American Indians were a deeply spiritual people and they communicated their history, thoughts, ideas and dreams from generation to generation through Symbols and Signs such as the Red Horn symbol. The origin of the Red Horn symbol derives from the ancient Mississippian culture of the Mound Builders of North America and were major elements in the Southeastern Ceremonial Complex of American prehistory (S.E.C.C.). Some of the Siouan Indian tribes still retain some elements of the Mississippi culture and the legend of Red Horn. Their sacred rites, myths and symbols and are presumed to descend from the Mississippians. The Red Horn symbol featured strongly in the Mississippian culture. The Mound Builders believed that Red Horn was one of the five sons of Earthmaker whom the Creator formed with his own hands and sent to earth to rescue mankind. Red Horn was a great hero and led war parties against the enemies of the people and supernatural monsters and demons from the Underworld including the Great Serpent and the Horned Panther. Red Horn legends of the Ho-Chunk and Winnebago tribes include adventures with Turtle and the thunderbird and battles against a race of giants. The above picture shows a Red Horn Symbol, a great hero in Mississippian mythology and known as "He Who Wears human heads as earrings" to the Sioux. His name is interesting as the Mississippians cut off the heads of their enemies as a trophy of their success. The severed head proves his prowess as a great warrior. 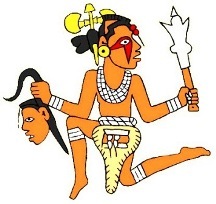 The Warrior Symbol depicts a man carrying a head. This action was part of the culture of the Mississippians and the severed heads of enemies were displayed on 40 foot wooden pools during their Chunkey games.